Born in Kamakura in 1949. She started piano at 7 and music was in her life. 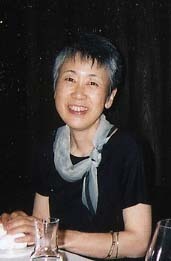 In 1968 joined “Tokyo Heinrich Schuetz Chor” founded by Mrs. Yumiko Tanno. Continuously singing religious chorus music in German, Latin, English, etc. Since 1993, she focused only on calligraphy. In Japan and in Germany, developing exhibition campaigns as a free artist. Member of “Calligrapher’s Guild” (Japan) as well as “Ars Scribendi” (Germany).